Today, we're releasing the latest Slides API tutorial in our video series. This one goes back to basics a bit: adding text to presentations. But we also discuss shapes—not only adding shapes to slides, but also adding text within shapes. Most importantly, we cover one best practice when using the API: create your own object IDs. By doing this, developers can execute more requests while minimizing API calls. Placing or manipulating shapes or images on slides requires more information so the cloud service can properly render these objects. Be aware that it does involve some math, as you can see from the Page Elements page in the docs as well as the Transforms concept guide. In the video, I drop a few hints and good practices so you don't have to start from scratch. For a detailed look at the complete code sample featured in the DevByte, check out the deep dive post. As you can see, adding text is fairly straightforward. If you want to learn how to format and style that text, check out the Formatting Text post and video as well as the text concepts guide. To learn how to perform text search-and-replace, say to replace placeholders in a template deck, check out the Replacing Text & Images post and video as well as the merging data into slides guide. We hope these developer resources help you create that next great app that automates the task of producing presentations for your users! We are excited to share TensorFlow Debugger (tfdbg), a tool that makes debugging of machine learning models (ML) in TensorFlow easier. Training or performing inference on the graph by using the Session.run() method. If errors and bugs occur during the second stage (i.e., the TensorFlow runtime), they are difficult to debug. To understand why that is the case, note that to standard Python debuggers, the Session.run() call is effectively a single statement and does not exposes the running graph's internal structure (nodes and their connections) and state (output arrays or tensors of the nodes). Lower-level debuggers such as gdb cannot organize stack frames and variable values in a way relevant to TensorFlow graph operations. A specialized runtime debugger has been among the most frequently raised feature requests from TensorFlow users. tfdbg addresses this runtime debugging need. Let's see tfdbg in action with a short snippet of code that sets up and runs a simple TensorFlow graph to fit a simple linear equation through gradient descent. As the highlighted line in this example shows, the session object is wrapped as a class for debugging (LocalCLIDebugWrapperSession), so the calling the run() method will launch the command-line interface (CLI) of tfdbg. Using mouse clicks or commands, you can proceed through the successive run calls, inspect the graph's nodes and their attributes, visualize the complete history of the execution of all relevant nodes in the graph through the list of intermediate tensors. By using the invoke_stepper command, you can let the Session.run() call execute in the "stepper mode", in which you can step to nodes of your choice, observe and modify their outputs, followed by further stepping actions, in a way analogous to debugging procedural languages (e.g., in gdb or pdb). A screencast of the TensorFlow Debugger in action, from this tutorial. Compared with alternative debugging options such as Print Ops, tfdbg requires fewer lines of code change, provides more comprehensive coverage of the graphs, and offers a more interactive debugging experience. It will speed up your model development and debugging workflows. It offers additional features such as offline debugging of dumped tensors from server environments and integration with tf.contrib.learn. To get started, please visit this documentation. This research paper lays out the design of tfdbg in greater detail. The minimum required TensorFlow version for tfdbg is 0.12.1. To report bugs, please open issues on TensorFlow's GitHub Issues Page. For general usage help, please post questions on StackOverflow using the tag tensorflow. This project would not be possible without the help and feedback from members of the Google TensorFlow Core/API Team and the Applied Machine Intelligence Team. Posted by Shanqing Cai, Software Engineer, Tools and Infrastructure. In just its first year, TensorFlow has helped researchers, engineers, artists, students, and many others make progress with everything from language translation to early detection of skin cancer and preventing blindness in diabetics. We're excited to see people using TensorFlow in over 6000 open-source repositories online. It's faster: TensorFlow 1.0 is incredibly fast! XLA lays the groundwork for even more performance improvements in the future, and tensorflow.org now includes tips & tricks for tuning your models to achieve maximum speed. We'll soon publish updated implementations of several popular models to show how to take full advantage of TensorFlow 1.0 - including a 7.3x speedup on 8 GPUs for Inception v3 and 58x speedup for distributed Inception v3 training on 64 GPUs! It's more flexible: TensorFlow 1.0 introduces a high-level API for TensorFlow, with tf.layers, tf.metrics, and tf.losses modules. We've also announced the inclusion of a new tf.keras module that provides full compatibility with Keras, another popular high-level neural networks library. It's more production-ready than ever: TensorFlow 1.0 promises Python API stability (details here), making it easier to pick up new features without worrying about breaking your existing code. Python APIs have been changed to resemble NumPy more closely. For this and other backwards-incompatible changes made to support API stability going forward, please use our handy migration guide and conversion script. Experimental release of XLA, a domain-specific compiler for TensorFlow graphs, that targets CPUs and GPUs. XLA is rapidly evolving - expect to see more progress in upcoming releases. Introduction of the TensorFlow Debugger (tfdbg), a command-line interface and API for debugging live TensorFlow programs. New Android demos for object detection and localization, and camera-based image stylization. Installation improvements: Python 3 docker images have been added, and TensorFlow's pip packages are now PyPI compliant. This means TensorFlow can now be installed with a simple invocation of pip install tensorflow. Click here for a link to the livestream and video playlist (individual talks will be posted online later in the day). The TensorFlow ecosystem continues to grow with new techniques like Fold for dynamic batching and tools like the Embedding Projector along with updatesto our existing tools like TensorFlow Serving. We're incredibly grateful to the community of contributors, educators, and researchers who have made advances in deep learning available to everyone. We look forward to working with you on forums like GitHub issues, Stack Overflow, @TensorFlow, the discuss@tensorflow.org group, and at future events. There are over 200 sessions happening next month at Google Cloud's Next 2017 conference in San Francisco... so many choices! Along with content geared towards Google Cloud Platform, this year features the addition of G Suite so all 3 pillars of cloud computing (IaaS, PaaS, SaaS) are represented! There are already thousands of developers including Independent Software Vendors (ISVs) creating solutions to help schools and enterprises running the G Suite collaboration and productivity suite (formerly Google Apps). If you're thinking about becoming one, consider building applications that extend, enhance, and integrate G Suite apps and data with other mission critical systems to help businesses and educational institutions succeed. If that's not enough Apps Script for you, or you're new to that technology, swing by to hear its Product Manager give you an introduction in his talk, Using Google Apps Script to automate G Suite. If you haven't heard of Apps Script before, you'll be wondering why you haven't until now! If you want a headstart, here's a quick intro video to give you an idea of what you can do with it! Did you know that Apps Script also powers "add-ons" which extend the functionality of Google Docs, Sheets, and Forms? Then come to "Building G Suite add-ons with Google Apps Script". Learn how you can leverage the power of Apps Script to build custom add-ons for your business, or monetize by making them available in the G Suite Marketplace where administrators or employees can install your add-ons for their organizations. Not a software engineer but still code as part of your profession? Want to build a custom app for your department or line of business without having to worry about IT overhead? You may have heard about Google App Maker, our low-code development tool that does exactly that. Curious to learn more about it? Hear directly from its Product Manager lead in his talk entitled, "Citizen developers building low-code apps with App Maker on G Suite." All of these talks are just waiting for you at Next, the best place to get your feet wet developing for G Suite, and of course, the Google Cloud Platform. Start by checking out the session schedule. Next will also offer many opportunities to meet and interact with industry peers along with representatives from all over Google who love the cloud. Register today and see you in San Francisco! Today, we're launching the Google Developers India channel: a brand new Youtube channel tailored for Indian Developers. The channel will include original content like interviews with local experts, developer spotlights, technical tutorials, and complete Android courses to help you be a successful developer. By 2018, India will have the largest developer base in the world with over 4 million developers. Our initiative to train 2 million Indian developers, along with the tremendous popularity of mobile development in the country and the desire to build better mobile apps, will be best catered by an India-specific developers channel featuring Indian developers, influencers, and experts. Tech Interviews: Advice from India's top developers, influencers and tech experts. Developer Stories: Inspirational stories of Indian developers. DevShow India: A weekly show that will keep new and seasoned developers updated on all the news, trainings, and API's from Google. Skilled to Scaled: A real life developer journey that takes us from the germination of an idea for an app, all the way to monetizing it on Google Play. The channel is live now. Click here to check it out. TL;DR: Today, we're adding a feature to the AMP integration in Google Search that allows users to access, copy, and share the canonical URL of an AMP document. But before diving deeper into the news, let's take a step back to elaborate more on URLs in the AMP world and how they relate to the speed benefits of AMP. What's in a URL? On the web, a lot - URLs and origins represent, to some extent, trust and ownership of content. When you're reading a New York Times article, a quick glimpse at the URL gives you a level of trust that what you're reading represents the voice of the New York Times. Attribution, brand, and ownership are clear. Recent product launches in different mobile apps and the recent launch of AMP in Google Search have blurred this line a little. In this post, I'll first try to explain the reasoning behind some of the technical decisions we made and make sense of the different kinds of AMP URLs that exist. I'll then outline changes we are making to address the concerns around URLs. Although having three different URLs with different origins for essentially the same content can be confusing, there are two main reasons why these different URLs exist: caching and pre-rendering. Both are large contributors to AMP's speed, but require new URLs and I will elaborate on why that is. Let's start with AMP Cache URLs. Paul Bakaus, a Google Developer Advocate for AMP, has an excellent post describing why AMP Caches exist. Paul's post goes into great detail describing the benefits of AMP Caches, but it doesn't quite answer the question why they require new URLs. The answer to this question comes down to one of the design principles of AMP: build for easy adoption. AMP tries to solve some of the problems of the mobile web at scale, so its components must be easy to use for everyone. There are a variety of options to get validation, proximity to users, and other benefits provided by AMP Caches. For a small site, however, that doesn't manage its own DNS entries, doesn't have engineering resources to push content through complicated APIs, or can't pay for content delivery networks, a lot of these technologies are inaccessible. 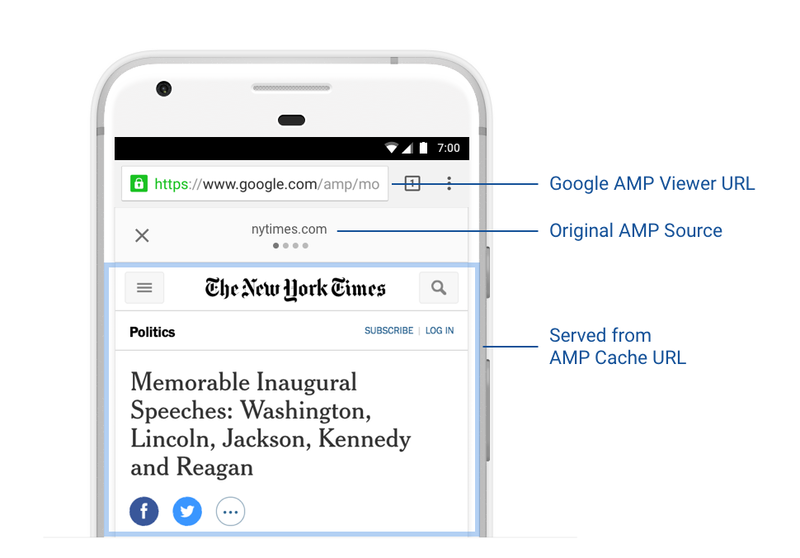 For this reason, the Google AMP Cache works by means of a simple URL "transformation." A webmaster only has to make their content available at some URL and the Google AMP Cache can then cache and serve the content through Google's world-wide infrastructure through a new URL that mirrors and transforms the original. It's as simple as that. Leveraging an AMP Cache using the original URL, on the other hand, would require the webmaster to modify their DNS records or reconfigure their name servers. While some sites do just that, the URL-based approach is easier to use for the vast majority of sites. In the previous section, we learned about Google AMP Cache URLs -- URLs that point to the cached version of an AMP document. But what about www.google.com/amp URLs? Why are they needed? These are "AMP Viewer" URLs and they exist because of pre-rendering. AMP's built-in support for privacy and resource-conscientious pre-rendering is rarely talked about and often misunderstood. AMP documents can be pre-rendered without setting off a cascade of resource fetches, without hogging up users' CPU and memory, and without running any privacy-sensitive analytics code. This works regardless of whether the embedding application is a mobile web page or a native application. The need for new URLs, however, comes mostly from mobile web implementations, so I am using Google's mobile search result page (SERP) as an illustrative example. The user's browser loads the document and the AMP runtime and starts rendering the AMP page. Since all other resources, such as images and embeds, are managed by the AMP runtime, nothing else is loaded at this point. The AMP runtime may decide to fetch some resources, but it will do so in a resource and privacy sensible way. As you can see, this operation is incredibly cheap - there is no network activity or hard navigation to a new page involved. This leads to a near-instant loading experience of the result. All of the above happens while the user is still on the original page (in our example, that's the search results page). In other words, the user hasn't gone to a different page; they have just viewed an iframe on the same page and so the browser doesn't change the URL. We still want the URL in the browser to reflect the page that is displayed on the screen and make it easy for users to link to. When users hit refresh in their browser, they expect the same document to show up and not the underlying search result page. So the AMP viewer has to manually update this URL. This happens using the History API. This API allows the AMP Viewer to update the browser's URL bar without doing a hard navigation. The question is what URL the browser should be updated to. Ideally, this would be the URL of the result itself (e.g., www.example.com/amp/doc.html); or the AMP Cache URL (e.g., www-example-com.cdn.ampproject.org/www.example.com/amp/doc.html). Unfortunately, it can't be either of those. One of the main restrictions of the History API is that the new URL must be on the same origin as the original URL (reference). This is enforced by browsers (for security reasons), but it means that in Google Search, this URL has to be on the www.google.com origin. The previous section explained restrictions on URLs that an AMP Viewer has to handle. These URLs, however, can be confusing and misleading. They can open up the doors to phishing attacks. If an AMP page showed a login page that looks like Google's and the URL bar says www.google.com, how would a user know that this page isn't actually Google's? That's where the need for additional attribution comes in. 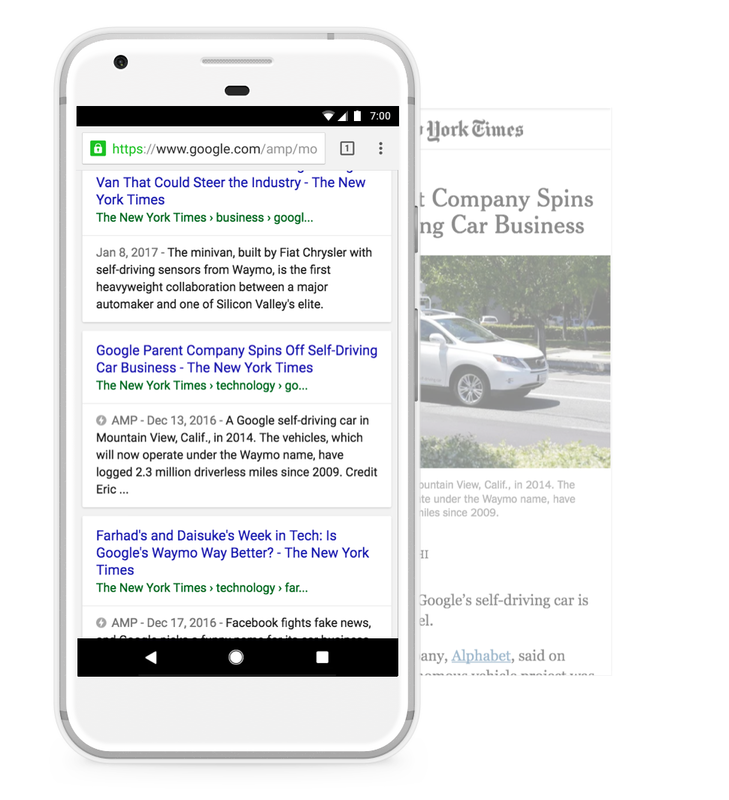 To provide appropriate attribution of content, every AMP Viewer must make it clear to users where the content that they're looking at is coming from. And one way of accomplishing this is by adding a header bar that displays the "true" origin of a page. I hope the previous sections made it clear why these different URLs exist and why there needs to be a header in every AMP viewer. We have heard how you feel about this approach and the importance of URLs. So what next? As you know, we want to be thoughtful in what we do and ensure that we don't break the speed and performance users expect from AMP pages. In addition to the above, many users have requested a way to access, copy, and share the canonical URL of a document. 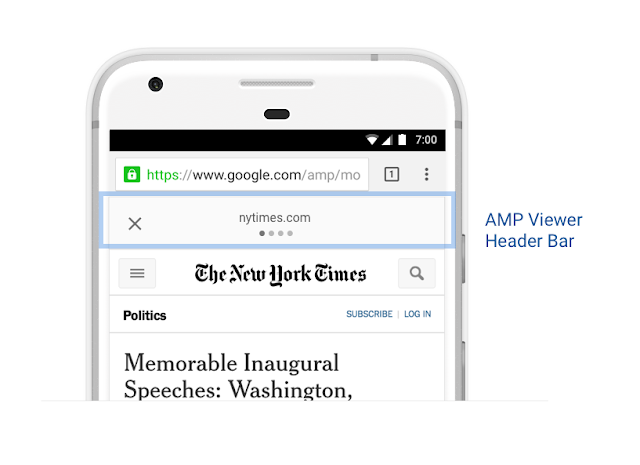 Today, we're adding support for this functionality in form of an anchor button in the AMP Viewer header on Google Search. 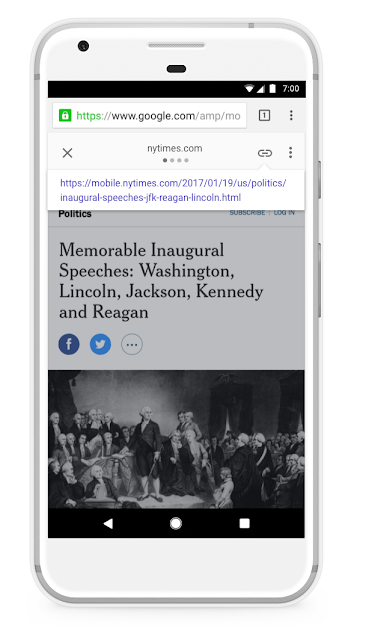 This feature allows users to use their browser's native share functionality by long-tapping on the link that is displayed. In the coming weeks, the Android Google app will share the original URL of a document when users tap on the app's share button. This functionality is already available on the iOS Google app. Lastly, we're working on leveraging upcoming web platform APIs that allow us to improve this functionality even further. One such API is the Web Share API that would allow AMP viewers to invoke the platform's native sharing flow with the original URL rather than the AMP viewer URL. The Associate Android Developer Certification program was announced at Google I/O 2016, and launched a few months later. Since then, over 322 Android developers spanning 61 countries have proven their competency and earned the title of Google Certified Associate Android Developer. To establish a professional standard for what it means to be an Associate Android developer in the current job market, Google created this certification, which allows us to recognize developers who have proven themselves to uphold that standard. We conducted a job task analysis to determine the required competencies and content of the certification exam. Through field research and interviews with experts, we identified the knowledge, work practices, and essential skills expected of an Associate Android developer. The certification process consists of a performance-based exam and an exit interview. The certification fee includes three exam attempts. The cost for certification is $149 USD, or 6500 INR if you reside in India. After payment, the exam will be available for download, and you have 48 hours to complete and submit it for grading. In the exam, you will implement missing features and debug an Android app using Android Studio. If you pass, you will undergo an exit interview where, you will answer questions about your exam and demonstrate your knowledge of Associate Android Developer competencies. Earning your AAD Certification signifies that you possess the skills expected of an Associate Android developer, as determined by Google. You can showcase your credential on your resume and display your digital badge on your social media profiles. As a member of the AAD Alumni Community, you will also have access to program benefits focused on increasing your visibility as a certified developer. Test your Android development skills and earn the title of Google Certified Associate Android Developer. Visit g.co/devcertification to get started!